When it comes to wedding ceremonies, there aren’t many things that I do not love to include. In fact, I don’t think there is anything that I don’t love including, even naked wedding guests with no clothes on is more than welcome as far as I am concerned and yes, I have actually conducted a ceremony with naked guests before (a nudist wedding!) And so when couples come to me with their ideas, whatever they are, I am (usually) always 100% behind them. However, one thing that I’ve got mixed feelings about, feelings which are erring more to the negative than the positive, is the use of butterflies during a ceremony. I love animals, all animals. I’m vegetarian and mummy to three fur babies. I totally understand the beauty of butterflies. I can sit in my garden for hours watching the butterflies playfully going about their business. They are so mesmerizing to watch and so beautiful. 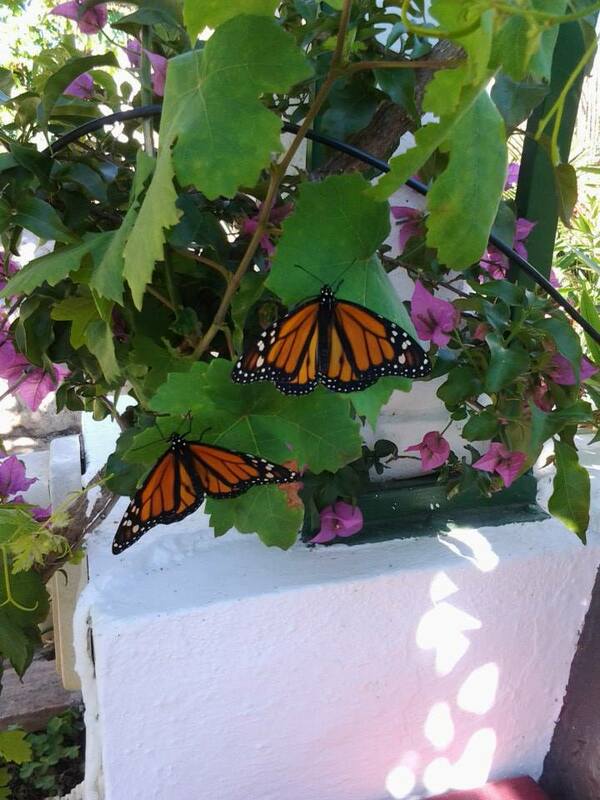 And this is how I love to see butterflies; free, majestic and unbridled, not boxed, drowsy and bewildered. I absolutely recognise the symbolism of a butterfly release and understand that in theory this, along with releasing doves during a ceremony for example, are highly emotive and can express really strong sentiments. I get it. Does anyone stop to think what becomes of these beautiful things after the ceremony is over and the party begins? I have in fact been witness to only two butterfly releases, which thankfully is a really low number compared to the number of ceremonies I have conducted. The first time I saw a butterfly release, I was in awe as much as the couple and the guests were, with how they flew out of the box and rested on laps, on hands, in peoples’, hair. It did look so pretty I cannot deny that and to say it didn’t would be a lie. But the butterflies, those that did fly out of the box, didn’t act like how butterflies normally do. You know how hard it is to get close to a butterfly, let alone have one sit on your hand for fifteen minutes, well it made me wonder why they were like that. Why didn’t they fly away? Why did they seem half asleep, or were they half dead? It also unnerved me that during the ceremony before the release, I could hear the butterflies rattling away inside, banging against the sides of the box. For all the beauty that I witnessed from being so close to nature, I still couldn’t help but feel that using creatures in this way for our own purposes was innately wrong, despite the best efforts of breeders to ensure they are delivered safely etc etc. And I think the desire to do something ‘cute’ and ‘different’ during a wedding ceremony, should take a back seat to the wider ethical/environmental implications. There is much debate between conservationists and butterfly breeders about the merits of releasing butterflies, too much to go into in this post, but you may want to read this post for a fairly balanced view on the pros and cons of releasing butterflies. It is written by a breeder but I still think he manages to highlight the issues well. I also have the same gut reaction with doves, which thankfully I have not seen released before. I’m sure the people who own doves that are used for ceremonial releases, love them and care for them very well, but I still have a problem with caged birds per se, which also feeds into my problem about releasing doves. Early on this year, the Pope (yes, I never thought I would ever be linking to anything to do with the Pope!) released two white doves, which were immediately attacked and killed by some gulls. The National Geographic has a really nice explanation on why this may have happened, as well as some disturbing information about white doves being bred to be white, for such ceremonial type occasions. Again, wrong all on levels. I guess the reason I dislike and am against animal releases in ceremonies also stems from my dislike hatred of dolphin centres, circuses that use animals in their acts and zoos that have any type of performing animal. And I should know. I used to work at a dolphin centre, many moons ago when we lived in Mexico. Yes, these beautiful creatures were well cared for, if not loved, but their sole purpose in that centre was to pull overweight tourists around a swimming pool when really they shouldn’t have been there at all, but swimming free in the Pacific ocean and doing all the dolphiny things that dolphins should be doing. And I feel the same way about butterfly releases. Knowing that they have been bred, boxed and shipped, ready to be released into the wild, into some unknown fate, does not sit comfortably with me. Even if breeders say it’s fine and doesn’t affect the environment and doesn’t harm the butterflies, I still don’t like the idea that this process takes place simply to enjoy a bit of symbolism during a ceremony. I think balloon releases can be just as beautiful and symbolic and make a brilliant alternative to a butterfly or dove release. Not long ago, I conducted a ceremony where the couple released white dove shaped balloons! How cool is that? And what’s more, they were biodegradable balloons which were not going to cause havoc with the environment once they had served their purpose. Whilst I am on the subject of ceremonial releases, it’s also worth mentioning about Chinese lanterns too. I will tell you this, I have seen these lanterns released over the sea at night and have never ever experienced such a heart-warming moment. It was a New Year’s Eve and as I held hands with my husband, I wished that our dream of having a baby would come true. Our little man was born the following year. So that is how much I love these releases BUT and it is a but that needs capitalising, there are a lot of hidden dangers involved with them. The metal ring that is lit in order for the lantern to take flight has to go somewhere when the flames die out and the lanterns perish. Have you seen the photos of these metal rings found discarded in woodlands with rabbits and foxed caught up inside them? I have and they’re not bloody nice. Not to mention the potential fire hazards. And even lighting them over the sea, those metal rings are going to end up in the water somewhere, if not washed ashore and being a pollutant to the environment. If releasing balloons doesn’t strike you as a good enough alternative, there are lots of eco-friendly, other symbolic rituals that may float your boat and which don’t raise any ethical questions. You can read my post on the top symbolic rituals for wedding ceremonies. Most couples who think about having a butterfly or dove release during their ceremony, probably don’t even think of the wider impact of doing this. I really believe this. So I’d like to hope that maybe if just one person out there, who was thinking about a butterfly release, reads this and has doubts, does some more research and decides they’d prefer to do something that doesn’t involve animals and is more eco-friendly, then that would be a job well done, as far as I’m concerned. Are you thinking about doing a butterfly release in your ceremony? I would love to hear your thoughts on this. A LITTLE UPDATE: I had a ceremony recently (summer 2015) where the couple had a butterfly release, which I actually only found out about on the day! Although, I am against it, I don’t feel it is my place to tell couples this as it is everyone’s own decision. However, seeing this release just confirmed 100% everything I have said above. By the time they released the butterflies, nearly half of them were dead and the others flagging. After the ceremony, the box the butterflies were in was left on the table and one of the guests thinking he was being kind started to whack the bottom of the box to try to ‘encourage’ the remaining butterflies to fly out. The ones that could muster the energy simply dropped to the floor and joined the ones already there, many of which had been squashed by people mingling around the ceremony area post-ceremony. Yeah, it wasn’t great to say the least! So I stand by every word I say, when I say I am against this. What is a symbolic ritual and do I have to include one in my ceremony?